This Color Challenge was to use Poppy Parade, Real Red, Regal Rose and Alwa ys Artichoke. Again I used the Marker Layering Technique for this card and the Manhattan Flowers set. I used all three Red based colors on the flowers plus Daffodil Delight for the stamens. 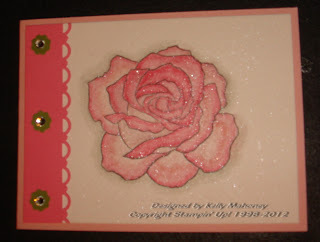 The background is simply done by stamping the flower in Always Artichoke ink several times on the card stock. I finished the bottom by punching out the border and layering a piece of poppy parade cs behind it. I added a little bling and added it to a Regal Rose card. This card is a 5x5" card.